EverGraze set out to achieve a goal – significantly increase profitability (by 50%) while maintaining ground cover, perenniality and reducing salinity risk by increasing water use. To achieve the goal, the project applied a principle: Put the Right Plant in the Right Place for the Right Purpose with the Right Management. Perennial feedbase combinations were combined with high performance livestock enterprises, and best practice livestock, soil and grazing management practices, to design farm systems which would achieve the goals. Pre-experimental modelling was used to test the potential of each proposed system. Adding 25% perennials to farm systems on the south coast of WA will give the highest gross margins. Deep-rooted summer active perennials kikuyu, lucerne and chicory extend the growing season and reduce the need for supplementary feed in summer and autumn compared to annual based pasture systems in south coast Western Australia. Kikuyu, chicory and panic persist through dry seasons. Chicory and lucerne extend the growing season and provide quality feed in a lamb finishing system. The south coast of south-west Australia is characterised by a Mediterranean climate, periodic summer rainfall, infertile sandy soils and pastures which comprise of annual species, such as legumes, grasses and broadleaf weeds. As a consequence, in late summer and early autumn livestock typically consume supplemented dry or degraded pasture residues adding to the cost of production and reducing potential profit. In addition, producers set their stocking rates according to what they can economically carry through this period of the year. Research has demonstrated that summer-active perennials are capable of providing green herbage during this summer/autumn feed gap thereby reducing supplement costs, increasing stocking rates and enhancing profit. Additional environmental benefits include a reduced risk of soil erosion and salinisation. Perennials suited to this environment include kikuyu, lucerne, tall fescue, chicory, panic grass and setaria. 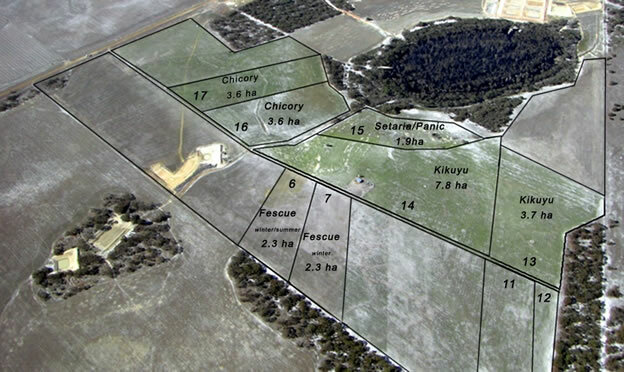 Kikuyu, the most widely grown perennial in the high rainfall zone, has been shown in paddock comparisons with annual based pastures to reduce supplementary feed and raise stocking rates significantly. However little is known about its impact on the profitability of the whole farm or the proportion of a system that should be sown to kikuyu to optimise for a particular livestock outcome. Sheep are an important component of farming systems on the south coast of WA amounting to 2.96 million head in 2011. Furthermore, analysis of various sheep enterprises has demonstrated that dual purpose Merinos are the most profitable in this region compared to meat or wool alone. 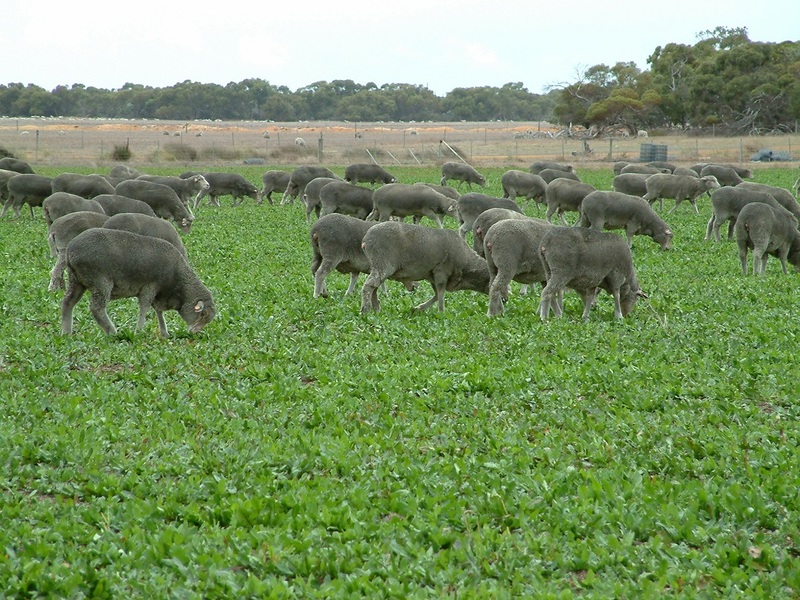 Given its objective to increase profit and improve environmental outcomes, the EverGraze project undertook some preliminary modelling to determine whether perennials could further increase the profitability of the dual purpose Merino enterprise. Encouragingly the results suggested farm profit could be raised from $32 to $104/ha/yr while deep drainage decreased, as the area of the farm under perennials increased from 0 to 70%. As expected increased profit was driven by higher pasture yield, superior feed quality in summer and autumn, reduced supplementary feed and higher stocking rates. 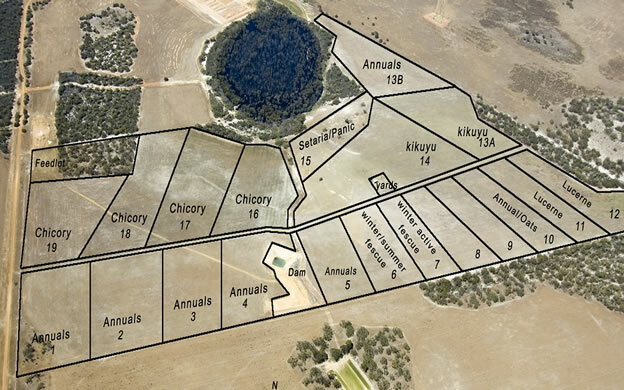 To test these findings a large scale field demonstration (Proof Site) was established on a commercial farm in Wellstead to test the hypothesis that summer-active perennials increase the profitability of dual purpose Merino enterprises in south west Australia. The Proof Site was established in the spring of 2005. The 60 ha system comprised of kikuyu, lucerne, tall fescue, chicory and setaria/panic pastures, all containing annual species such as subterranean clover (Figures 1, 2 and 3). Pastures were rotationally grazed with the exception of kikuyu. The Albany Proof Site soils page describes the soils suited to each of this species at the site. Merinotech ewes with an established high weaning percentage were joined to Poll Dorset rams in early February and lambs finished in December/January. The advantages of perennials are a higher ovulation rate at joining due to summer green feed, lambing shelter in winter, the ability to finish a proportion of the lambs on lucerne and chicory, a reduction in supplement fed, higher numbers of lamb turned off and modest increases in stocking rate from ~3 to 4.5 ewes/ha. Livestock, pasture and soil measurements were taken throughout the life of the demonstration. The Proof Site ran for three years from 2006 to 2008. Unfortunately these proved to be drought years and the site did not provide the production and profit results expected based on the pre-experimental modelling. The dry conditions did however test the persistence of the perennial species. Based on the Proof Site results, extensive biophysical and economic modelling was undertaken to evaluate the impact of perennials over a greater range of seasons, in different livestock production systems and with alternative management. The modeling identified a number of potentially more profitable livestock systems based on perennials.